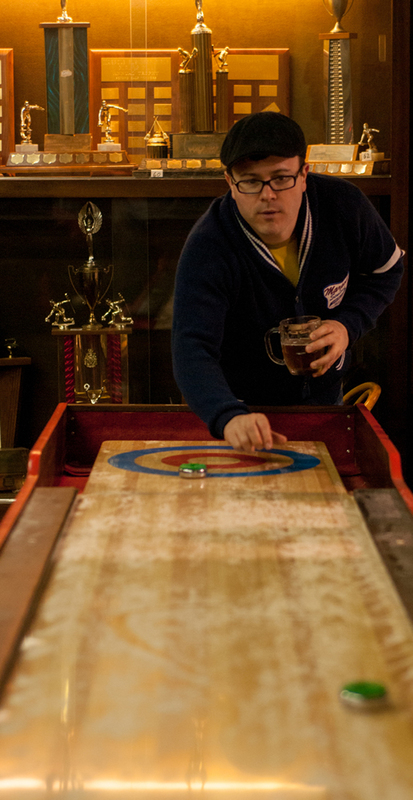 Our facility is full of character and includes six sheets of ice, lower & upper viewing areas, a cafe, and a spacious lounge with a walk-up bar. Adjoining the lounge we also have a meeting room and a games room . Our facility is fully wheelchair accessible, both on an off the ice. You’ll find the Marpole Cafe open Tuesday and Thursday for lunch beginning in mid-September. We also offer catering for all events at the Marpole Curling Club. Check out our catering page to take a look at our menu. The Dan Magnuson Room can meet all of your meeting room needs. It can be configured in a variety of ways and can seat smaller groups of 10-15 in a boardroom style and up to about 45 or so in a classroom style. Whether it’s a hockey draft, a small company board meeting or an informal organizational meeting, the Dan Magnuson Room can adapt to your needs. Check out our rentals page for rates and booking information. Our lounge offers several televisions and a ceiling mounted projector to watch your favourite sporting events. A full service bar with three beer taps along with a great selection of bottled beers and wines & spirits will greet you whether you are winding down from a hard day or warming up before a game. Prime seating for all six sheets of ice is available from the lounge allowing you to watch club activities in comfort. The lounge is also available for party rentals and has a large dance floor & disco ball for your celebrations. Ping pong anyone? 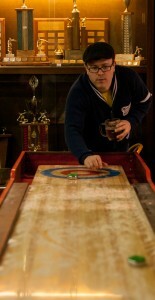 Our games room features a pool table, dart board, ping pong, shuffleboard, and many trophies of today and years gone by. This room is free to use for curlers at the club and those renting sheets of ice or the full facility. There is ample seating for about 20 people. 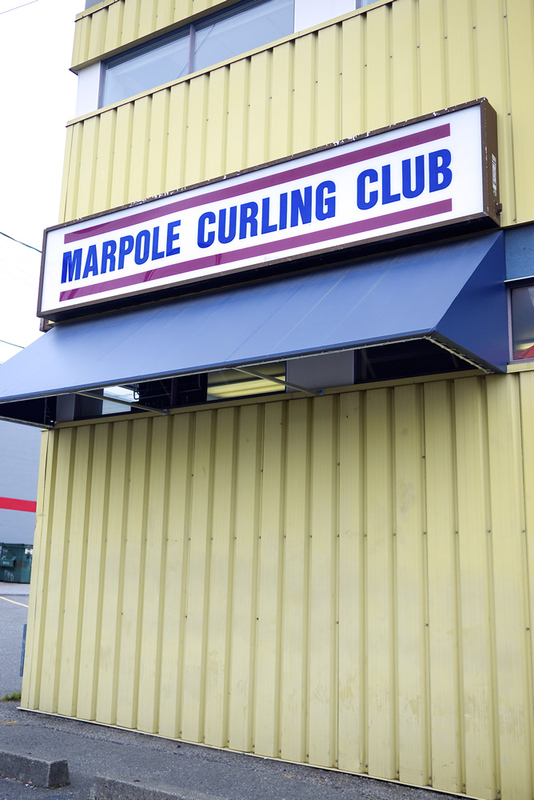 Our focus is to supply curlers with the supplies they need for day-to-day curling. We carry a wide variety of equipment including brooms, grippers, sliders, extender poles, gliders, stopwatches, etc. 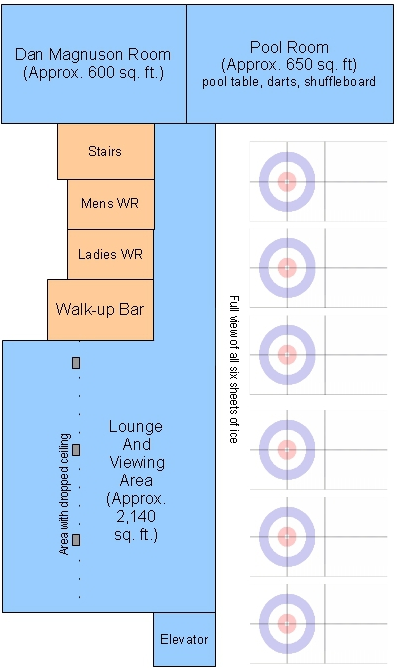 The diagram below gives you a better idea of the upstairs layout of our facility and the spaces available.